Trumpet Records was started by Willard and Lillian McMurry in Jackson, MS, in 1950. The label got its fame through blues recordings by Elmore James, Sonny Boy Williamson and others, but it also had a gospel catalogue of 15 issues. 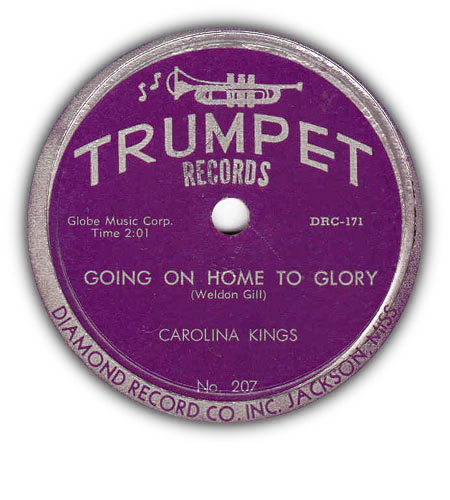 Trumpet 179 (Blue Jay Gospel Singers) and 208 (Carolina Kings) are both unreleased. Trumpet didn’t have a separate gospel series, the missing numbers are secular or unused/unknown (#120-127, 130, 148, 158, 159, 167). This page lists all known gospel releases on the Trumpet label.